On March 18, 2014, a group of student protestors raided and occupied the Legislative Yuan and later the Executive Yuan in Taiwan. The student-led movement lasted for about 3 weeks after Taiwan's President made significant concessions to change his non-transparent practices when signing the Cross-Strait Service Trade Agreement (CSSTA) with People's Republic of China. Mostly labelled as a movement of civil disobedience against government's dealings with China, the 318 Sunflower Student Movement is viewed as an important step toward the deepening of Taiwan's democratization process. Its repercussions were felt in Hong-Kong and Macao where similar civil disobedience movements had emerged. On the basis of the resource mobilization theory (RMT), the authors used a combination of case study and thematic analysis methods to examine the role of social media in political mobilization in Taiwan. This chapter identified two major recurrent themes as follows: challenging mainstream media and mobilizing multi-movement resources. When Taiwan’s 26th Golden Melody Awards announced its annual best song of the year, Island Sunrise, the broadcast segment showing its lead singer, Wei-Chieh Huang and the banner, “Today (Demolish) Dapu, Tomorrow (Overthrow) the Government” was censored in both China and Singapore (Xu, 2015). Huang’s banner has become a symbol of civil resistance that was ignited by the forced evictions in Dapu, Maoli County since 2013 and by the mysterious deaths of several tenants (Wang & Chung, 2013). The winning song happens to be the theme song of the now famed 318 Sunflower Student Movement in Taiwan that has reshaped the island country’s political landscape in 2014 (Chen, 2015; Chiou, 2014). Many scholars have foreseen that its repercussions are predicted to be felt in the upcoming presidential election when the opposition party’s candidate, Dr. Ing-Wen Tsai, later became Taiwan’s first female president after replacing the unpopular China-friendly President Yi-Jeou Ma (Bardenhagen, 2014; Chen, 2015; Hung & Stout, 2016; Rahaula, 2015). In the local election in 2014, the ruling Kuomingtang (henceforth, KMT) only won 6 out of 22 seats in municipal majors and county magistrates (Yeh, 2014). In January 2016, Democratic Progressive Party (henceforth, DDP) candidate Dr. Ing-Wen Tsai ultimately received a majority of 56 percent of the vote (Tiezzi, 2016). The DPP has also become the first-ever majority in Taiwan’s legislative election, winning 68 out of 113 seats (Tiezzi, 2016). Observers have concluded the DPP’s victories are attributed to KMT’s failing policies to engage China by maintaining “status quo,” to favor business interests in China, and the awareness of young people after the Sunflower Student Movement (Chen, 2015; Hunt & Stout, 2016; Tiezzi, 2016; Yeh, 2014). The 318 Student Sunflower Movement has attracted scholars’ attention because it demonstrates a good example of civil disobedience movement (Lin, 2015; Masahiro, 2014). Civil disobedience movement, or civil resistance movement, has swept most parts of the world because of many social issues related to the corporate power, unemployment (particularly among the youth and less skilled workers), income inequality, wealth distribution, etc. (Penney & Dadas, 2014). Like other social movements and protests, they serve an important function in a robust democracy (Jha, 2008). The rapid increase of civil disobedience movements in Taiwan has been attributed to President Ying-Jeou Ma’s pro-business and China-friendly regime (Misahiro, 2014). Taiwanese people were taken to the streets to protest against various causes, ranging from “the widespread expropriation of land for industrial development and urban redevelopment projects, against hazing deaths of army recruits, and against nuclear power plants” (Misahiro, 2014, para 11). Small local social movement groups (such as Citizen 1985 and the Black Island Nation Youth Alliance) have risen as a result of these increasing tensions attributed to government tax and real estate policies, frictions due to closer economic ties with China, strategies and tactics when dealings with China, etc. (Cole, 2014). However, the scale and influence of the Sunflower Student Movement have been assessed to exceed other civil disobedience movements (Misahiro, 2014). The analysis of this movement further demonstrates what social media are capable of accomplishing to address the lack of resources that many social movement groups are faced with. Mobile Social Media: A term to refer to social media applications such as Facebook, Foursquare, Instagram, Pinterest, Twitter, etc., that are delivered via mobile devices such as smartphone, tablet, or laptop computer. Chinese Jasmine Revolution: The civil rights movement is also known as The 2011 Chinese Pro-democracy Protests . Chinese Jasmine Revolution was a social movement organized and mobilized through Weibo to launch protests in 13 major cities in China on February 20, 2011. Despite national and international media attention, the defunct Chinese Jasmine Revolution did not lead to wide-spread protests in China. After the mass incident, a large number of dissidents had been arrested and detained. Electronic Frontier Foundation (EFF): The Electronic Frontier Foundation (EFF) is the leading non-profit organization that specializes in the protection of civil liberties in the digital world. EFF was founded in 1990 and has championed user privacy, and free expression, and issues related to grassroots activism, litigation, policy analysis, and technology development. Thematic (Content) Analysis: A research method to describe and analyze qualitative textual data from interview transcripts. Civil Society: According to the definition provided by The World Bank, civil society refers to a variety of not-for-profit and non-governmental organizations that enable the expression of the interests and values of the public as well as their members for cultural, ethical, political, philanthropic, scientific, and religious concerns. Civil society organizations refer to charitable organizations, community groups, faith-based organizations, foundations, labor unions, non-governmental organizations (NGOs), labor unions, and professional associations. Rhetorical Agency: A term derived from Kenneth Burke’s pentadic rhetorical framework. Rhetorical agency is defined as inherently human capacity to act and is an intrinsically human ability to act upon evaluations and to question. Occupy Wall Street Movement (OWS): The term refers to a protest movement that began on September 17, 2011 in Zuccotti Park, in the Wall Street financial district. The event ushered many occupy movements in other countries to challenge social and economic inequality worldwide. Content Filtering Mechanisms: Used as a computer program to filter or block inappropriate Internet contents before delivered to users’ end. The mechanisms function as a shield between the Internet and other service providers to block objectionable materials. Civil Disobedience: Proposed by the American transcendentalist, Henry David Thoreau, the term is equivalent to non-violent resistance to avoid enabling the government to make them the cause of injustice. The term is also defined as the active, professed refusal to abide by laws, demands, and commands of any government. Public Sphere: Habermas (1962 AU129: The in-text citation &quot;Habermas (1962&quot; is not in the reference list. Please correct the citation, add the reference to the list, or delete the citation. , 1984) defined the concept of public sphere as “a realm of our social life in which something approaching public opinion can be formed” (p. 49). Habermas’s (1962 AU130: The in-text citation &quot;Habermas&#x2019;s (1962&quot; is not in the reference list. Please correct the citation, add the reference to the list, or delete the citation. , 1984) conceptualization of public sphere emphasizes the important of access to all citizens to enable them to transform from private individuals into a public body. Online Activism: Also known as Internet activism, digital activism, online organizing, electronic advocacy, cyber-activism, and e-activism. 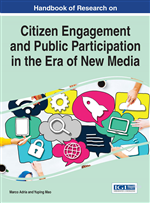 The term is defined as the use of new information-communication technologies to support social and citizen movements. Big Data: A term that describes a large dataset that grows in size over time. It refers to the size of dataset that exceeds the capturing, storage, management, and analysis of traditional databases. The term refers to the dataset that has large, more varied, and complex structure, accompanies by difficulties of data storage, analysis, and visualization. Big Data are characterized with their high-volume, -velocity and –variety information assets. Political Mobilization: The term refers to activities that intend to motivate masses of participants to express themselves and to undertake a particular political action. Co-Word Analysis: A content analysis technique that is used to map the strength of association between keywords in textual data. This technique measures the co-occurrence of keywords to examine content in the textual data. This research technique has been used in analyzing a large amount of data from social media. Arab Spring: The term refers to a revolutionary wave of demonstrations and protests in the Arab world, spreading from Tunisian Revolution to other countries in the Arab League on December 17, 2010. Leaders in Tunisia, Egypt, Libya, and Yemen have been forced from power by the end of February 2012. Umbrella Revolution: A sit-in protest in Hong-Kong that began in September 2014. Also known as umbrella movement, this civil disobedience movement was prompted when the Standing Committee of the National People’s Congress proposed an unsatisfactory and highly restrictive electoral system reform. According to the reform, only pre-screened candidates can take part in Hong-Kong’s election. Areas such as Admiralty, Causeway Bay, and Mong Kok were occupied by the protesters for over 70 days. Twitter: A social media platform that allows users to send and receive messages about 140 words, called “tweets.” This social media platform was created in March 2006 and launched by July 2006. Twitter has attracted a lot of users since its launch. As of May 2015, there are more than 500 million users and 302 million of them are active users. Occupy Central with Love and Peace Movement: Refer to as a civil disobedience movement in Hong-Kong’s financial district. The movement began on September 28, 2014 to respond to whether Beijing and Hong-Kong’s government will implement universal suffrage to elect its chief executive in 2017. Resource Mobilization Theory (RMT): A major sociological theory that focuses on the resource acquisition and management of social movements. RMT aims to analyze the followings: 1) the acquisition of resources; 2) the mobilization of people to achieve the movement’s goals. Social media: Andreas Kaplan and Michael Haenlein (2010) AU131: The in-text citation &quot;Andreas Kaplan and Michael Haenlein (2010)&quot; is not in the reference list. Please correct the citation, add the reference to the list, or delete the citation. defined social media as “a group of Internet-based applications that build on the ideological and technological foundations of Web 2.0, and that allow the creation and exchange of user-generated content.” Social media include collaborative projects (such as Wikipedia), microblogs and blogs, contents (such as YouTube), social networking services (such as Facebook), virtual games, and virtual social life (such as Second Life). Information-Communication Technologies (ICTs): Also abbreviated as ICTs. The term is used as an umbrella to cover all communication devices and applications such as cellular phones, computer and social media.